Christmas came early this year for Syria's Assad as Russia yesterday confirmed delivery of its feared S-300 surface-to-air missile system. 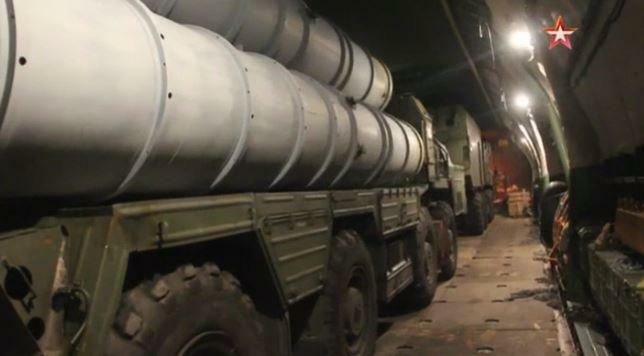 And on Wednesday Russian TV aired footage and provided photos of what are unmistakably the S-300 missiles being offloaded large cargo transport planes in Syria. The nighttime footage shows the hardware being unloaded from the cargo door of the massive Antonov An-124 Ruslan, also called 'the Condor', which is known to be able to carry a payload of 120 tons. Russian Defense Minister Sergei Shoigu had told Putin on Tuesday in a televised meeting, "The work was finished a day ago," and that the transfer includes 49 pieces of military hardware. Video and official photos appear to show a launcher, radar, control vehicles, and missile tubes. Russian advisers will now train Syrian personnel to operation the new weapons, which is expected to take up to a few months, with the likelihood that Russians will man the active systems in the meantime, set to go fully operational by October 20. It's now confirmed that Moscow has fully followed through on its prior vow to move "swiftly and appropriately" in response to Israel's massive September 17 airstrikes on Syria which resulted in the accidental downing of a Russian reconnaissance plane with 15 people on board by Syrian defenses. Meanwhile, though clearly too little too late, the U.S. State Department said on Tuesday that it hopes the Russian Federation did not deliver the S-300 systems to Syria because if they did, it would be a “serious escalation”. “I cannot confirm that that is accurate. I hope that they did not, that would be a serious escalation and concern,” Nauert said when asked about the administration’s reaction to reports Russia had sent S-300 systems to Syria. Apparently Nauert now has photographic proof, however. The chief worrisome game changer for Netanyahu is that — as a Haaretz report noted previously — the range of the new defense system will give Damascus the ability to detect potentially hostile aircraft from point of origin inside Israel: "With Putin's S-300, Assad's army could even 'lock-on' IAF aircraft as they take off from bases within Israel." And as one Israeli defense analyst put it, "Israel should be worried." And Syria for its part has signaled to the Israelis that it's essentially gameover. Syria's Deputy Foreign Minister Faisal Mekdad recently said that "Israel, which has gotten used to carrying out attacks under various pretexts, will now have to weigh and rethink before attacking again." He told the Chinese news agency Xinhua: "The aggression against Syria is directed towards the forces that are fighting against terrorism in Syria. If Israel will try to attack we will defend our people as we did in the past." The Israeli Defense Forces (IDF) over the summer confirmed that it had struck targets inside Syria over 200 times within just the last year alone. But it now appears those days are over.